Hello everyone! lovely to see you again, it’s my Barflat birthday! Thirty eight years ago today I was dug up by farmers Gavin and Kevin Alston on Barflat’s field near Rhynie. Rhynie Man found in Barflat’s field near Rhynie, 10th March 1978. Photo courtesy of Aberdeenshire Council. The white marks you see on my face are from the plough, but don’t I look handsome. There are very few people on symbol stones, it is mainly symbols. I think I may have been quite important to the community who created me. The stone is gabbro, which is very hard, a bit like granite and would not have been easy to mark, so the people who made me must have had a lot of skill and time to place me on this large stone. 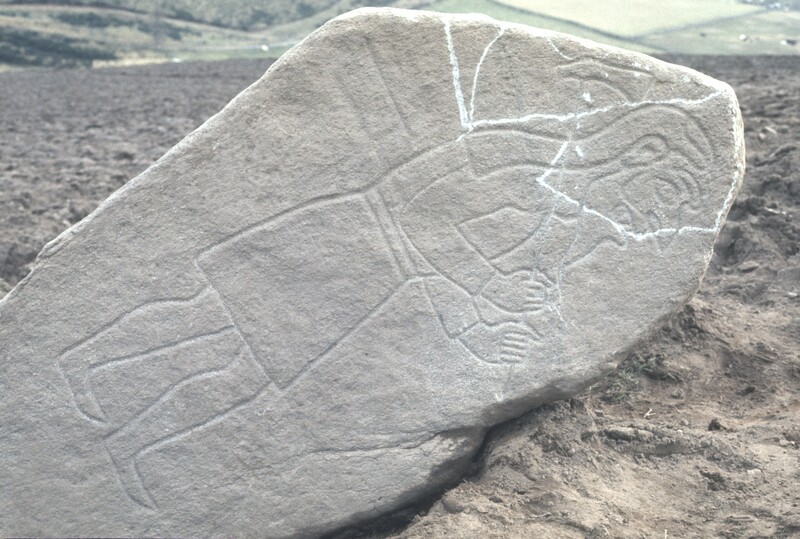 The Craw Stane in Barflats Field, the photograph has been taken from the location of where Rhynie Man was found. I was found in the same field as the ‘Craw Stane’, which is another symbol stone, one of eight found in Rhynie. Archaeologist Dr Gordon Nobel says Rhynie means ‘A very royal place’, which makes me feel very special. The archaeologists are planning and hoping to return to this field later this year, so I look forward to hearing about what else they might find out about us. I wonder if there will be any more stones? Three in total have been found in this field alone! The lovely ladies from Deveron Arts, Rhynie Woman and friends wished me happy Barflats Birthday! The best thing about being 38+ years old is that I got to celebrate my birthday! 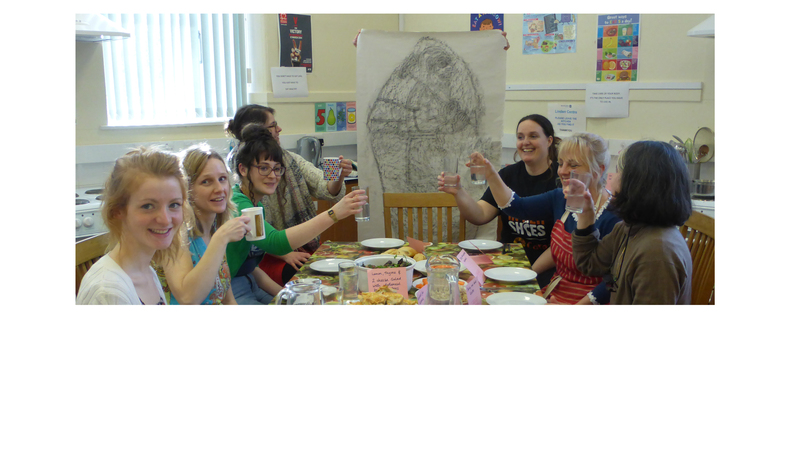 Rhynie Woman and Deveron Arts were hosting a ‘Make do and Mend’ cooking event. The lovely ladies and their friends brought things from their cupboards and they cooked and baked until the table was full of lots of lovely goodies. 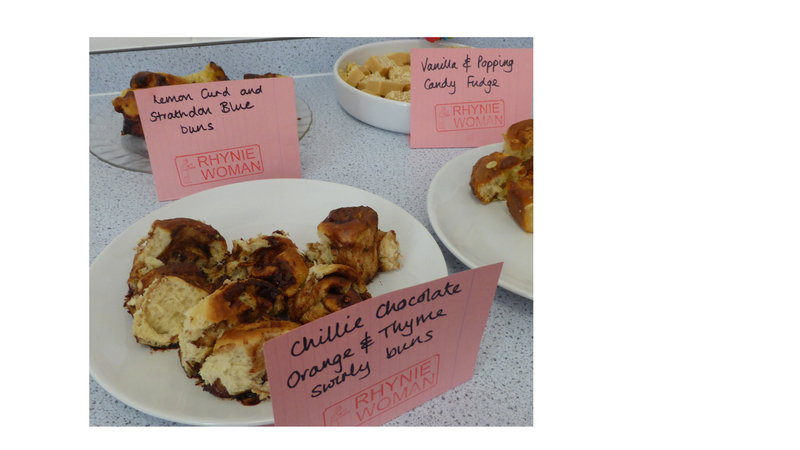 The menu included chillie chocolate and thyme meringues, tofu, kale and red onion filo surprises, quinoa and fruit pudding with mulled wine syrup and some lovely variations on Daisy’s Tap o Noth Buns. My favourite was the Lemon Curd and Blue Cheese bun, much more tasty than the bere barley bannocks I used to have. Anyway, I’m off for a lay down. In order to work off all that cake and fine food Rhynie Woman go for a run up Tap o Noth, but I’m not sure I’d manage it today, maybe next time.